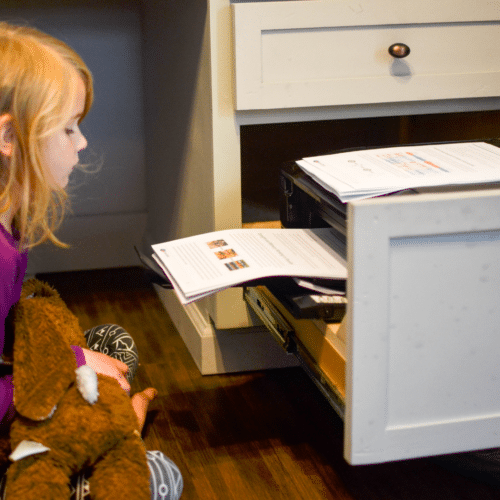 This is a sponsored post, with content originally found in “Decluttering the Homeschool House” from the Oak Meadow Blog originally posted on March 19, 2017 by Amanda Witman. Additional thoughts added by Heather Aliano after reading Marie Kondo’s “The Life Changing Magic of Tidying Up” (and attempting to work a little magic of her own in her homeschool). 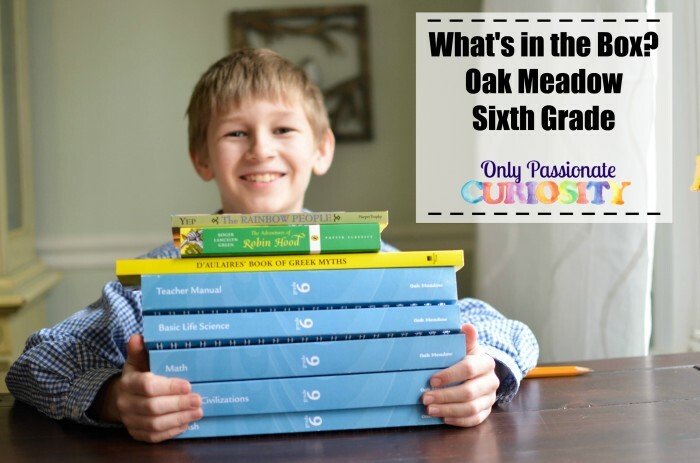 Oak Meadow’s flexible, family-friendly curriculum continues to bring my family joy. 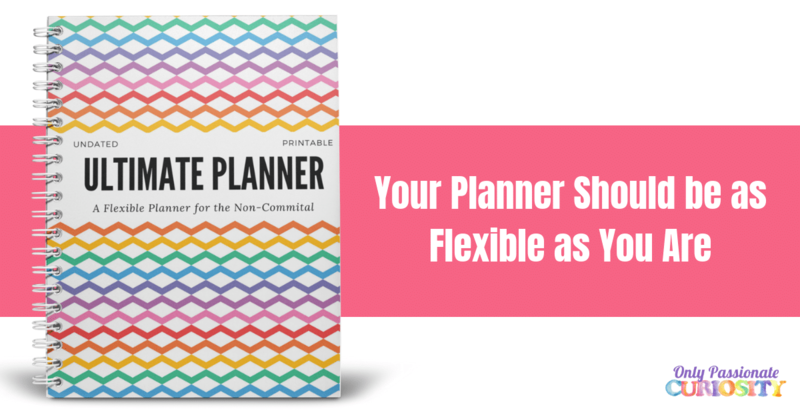 We’ve been using it for five years, and plan on continuing to use it for much longer! 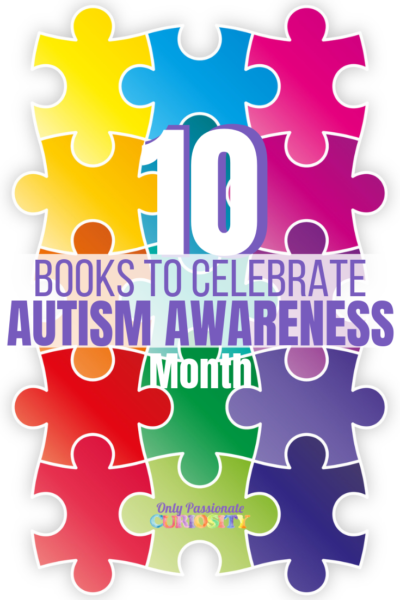 If you are looking for a complete curriculum that won’t clutter your shelves or your schedule, check it out! 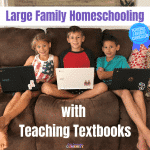 Homeschoolers usually spend a significant portion of their days at home. 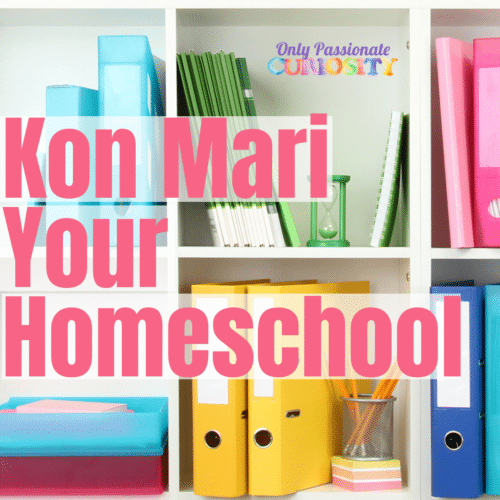 The many hours of projects, crafts, meals, and experiments that happen every day in a homeschooling house can add up to a significant amount of clutter and chaos. I have found my own homeschool to have gone through stages of clutter and chaos – stages that I don’t want to stay in. There have been seasons where I bought every single montessori manipulative I could get my hands on, because I was sure that’s what a good preschool mom would do. In other seasons, I filled my home with bits and baubles and pieces of felt and wool because I thought maybe I could be one of those awesome moms who handcrafted things. 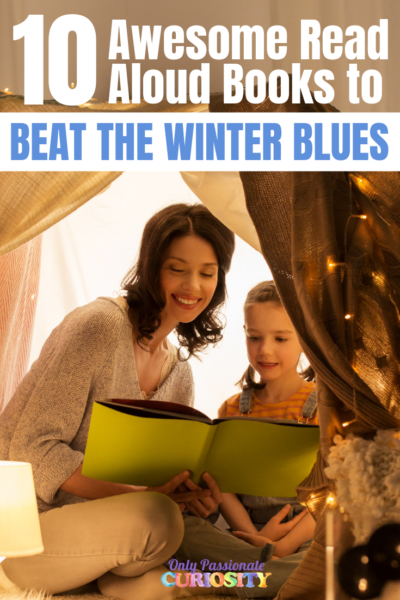 And then, there were seasons where I bought all the supplements and workbooks I came across because I was so unsure that I was doing the right thing and hadn’t yet found my footing as a homeschool mom. These days, I am much more confident in who I am, who my kids are, and how I want to teach them at home, and I want my homeschool environment to reflect that calm surety – rather than continue to serve as a museum for the many different kinds of homeschool mom I have been in the past. 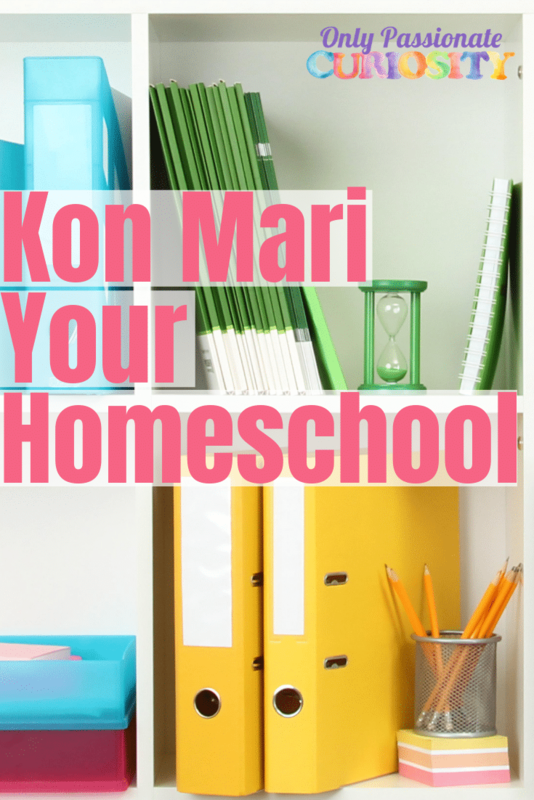 Are you overwhelmed by homeschooling stuff and want to clear out your space? Start here. Make sure that putting the items away where they belong is easy. Marie Kondo is quick to point out that when we want an item, we are eager and willing to put in the work to dig it out of storage. But, if it’s challenging to put the item away, it will lay around in the wrong spot for a long time. Items that are used often (like scissors) should have easy to access storage spaces. Less used items can be stored out of the way. It’s okay if it’s challenging to get items out, but it should be simple to put it away. Observe the patterns in your house. How are family members using the space? Where do piles of things usually grow? One of the biggest challenges in any house is keeping things up off the floor. Where do things most often get dropped? If you have a perpetual pile that grows unbidden in a particular place, it’s a sure sign that those items need a permanent home nearby. Put baskets for hats and mittens near where coats are hung. Unfinished works of art may need a shelf near the crafts area. 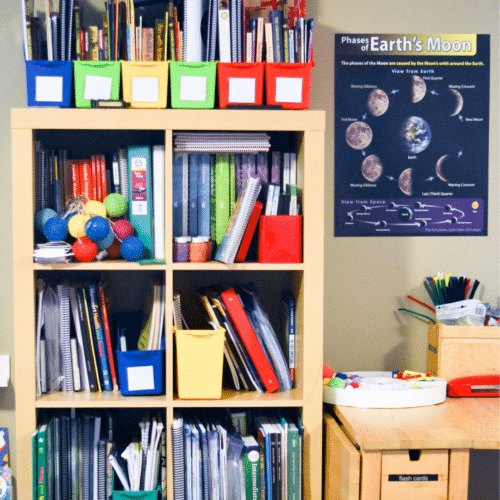 Create a homeschool command center with the books you use the most often. My printer was a source of clutter and an eyesore – it brings me more joy stored in a pull out drawer! We can get it out, and put it away easily. Make sure everyone has a job, and understands that each item needs a home. Don’t hang on to items you don’t want, or don’t serve you well. I find it helpful (and Marie Kondo suggests) sorting like items at the same time. For example, go through all of your art supplies at once, or all of your math curriculum. Do one pile at a time. It’s okay to take multiple days (or weeks, or months) to go through everything. You didn’t collect these items in a day, and you shouldn’t feel like you have to organize them in a day either. Deciding what to keep is pretty simple. You hold the item in your hand and see if it “sparks joy” for you. Some items, like scissors for example, may be hard to find joy in, but if you sort the whole pile at once, you may find that one of the pairs is the pair you always grab, and two of the scissors in your stash are sticky and dull. No need to keep the dull ones when you have that one pair that brings you joy for working so well! If your children have a hard time decluttering and sorting their school items, make it a game: “Keep or Don’t Keep?” See how fast you can sort through a pile together. Start with two containers for sorting things into—one “keep” bin and one “toss” bin. Hold up each item in turn and ask dramatically, “Keep? Or don’t keep?” Encourage your child to respond as quickly as possible for each item. You’ll find that your initial reaction to the item (joy or indifference) comes pretty quickly, and it will go better if you trust that first gut instinct. Time yourselves if it adds to the excitement. When the pile is gone, you can whisk the “toss” pile out of sight to minimize a change of heart. Marie Kondo would have you ask yourself if the item brings you joy – but it’s important to note that some items bring you joy because they serve you well – helping you create the life you want to live. Your child’s math book may not bring them joy when they hold it, but if it’s a good program that is pleasant enough for you to teach, and you know it will help create skills for your child that will serve them for the rest of their life . . . well, then that book is a keeper. Now, if you hold a book in your hands and it makes you want to cry on sight because it’s miserable to teach from . . . donate that bad boy without hesitating. Don’t feel like you have to hang on to curriculum that has been collecting dust, or represents your past instead of your future. If you’re the kind of person who shops at curriculum fairs, you may find that you have an excess of curriculum you didn’t use. Those history books that you wanted to make a unit study out of. Hands on science units that you didn’t open. All of the latin curriculum you thought you would teach but quit when you realized that learning latin is really hard (or is that just me?). Sometimes we buy things because we aspire to do things differently. We want to dig in deeper, or try a different method of learning, but the reality is there is only so much time in the day and energy to give. I have purchased many items over the years, especially before my family settled into Oak Meadow’s full curriculum. The more I tried to piecemeal subjects, the more clutter I had. I held on to these items for much longer than I should have, but the reality is I didn’t need to supplement our complete curriculum with Oak Meadow. It is okay to let go of these extra items. They aren’t serving you on your shelves. Especially if these items cause you to feel guilt, donate them or sell them and let them go. Embrace who you are as a homeschooler today, and who you want to be tomorrow, and let go of these past purchases that didn’t work out. Marie Kondo is quick to note that you should not purchase storage items until you are done sorting your belongings, and I agree with this. Hopefully, you’ll find room and bins and boxes as you empty out the items that no longer serve your or your family. These spaces and storage solutions can be repurposed as homes for the items you do want to keep. Don’t give up – Decluttering is an ongoing process. I have found that even though I completely finished the KonMari process in my home, I am never really done sorting my belongings. Over time, more items come in despite my best intentions to keep things out, items become worn, or they stop serving their purpose. Be aware of what clutter hits your nerves, and go back to the process of asking if items spark joy, serve you well, and have a home as you deal with it. Looking for curriculum that will bring you joy?